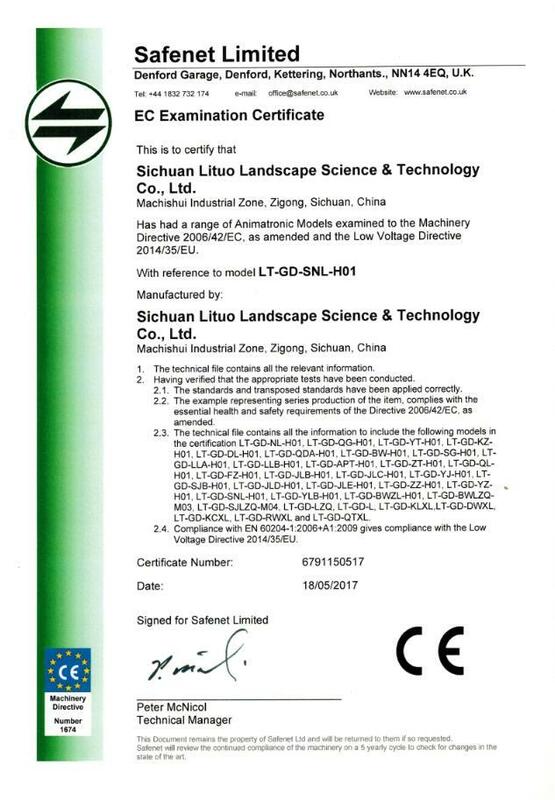 Company Overview - Sichuan Lituo Landscape Science And Technology Co., Ltd.
9YRSSichuan Lituo Landscape Science And Technology Co., Ltd.
Sichuan Lituo Landscape Science & Technology Co., Ltd. is a professional technical enterprise, specialized in manufacturing, designing and researching high intelligent and high lifelike craft products, such as animatronics /pneumatic/static dinosaurs, animals and robots, park rides, fossil, skeleton, sculpture, etc.Our company was established in 1996, is one of the earliest companies in this area in China. 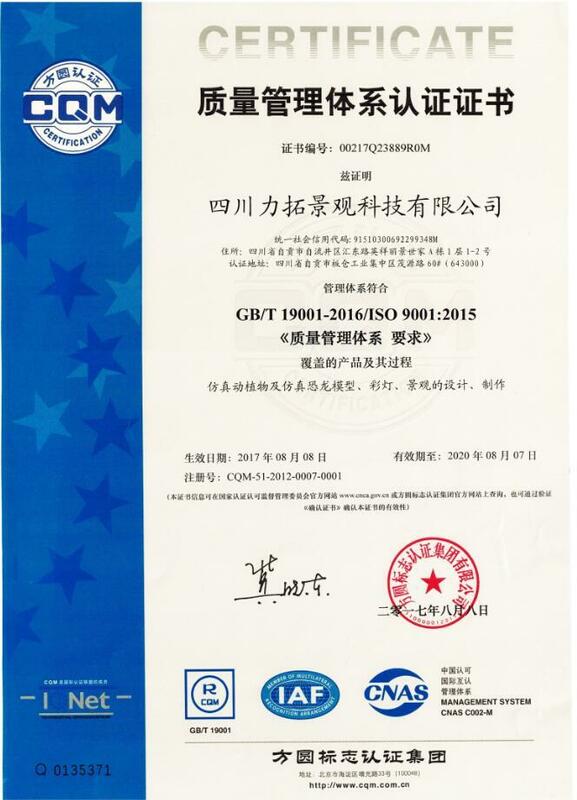 We got CE, ISO 9001: 2008, export license to assure our strength and high quality. From 1996 to now, we successfully designed and constructed many large technological exhibitions, dinosaur parks, education exhibitions, dinosaur museums, theme park, etc. Such as: China Dinosaur Park, Inner Mongolia Museum Dinosaur Hall, Greece Dinosaur Park, India Dinosaur Park, Austria Natural Museum, etc.Our products have high lifelike appearance, flexible movements, multi-function, rich sounds, vivid color, durable and competitive price, which are exported to more than 30 countries and regions, such as America, Britain, Germany, Russia, Australia, Egypt, Singapore and Korea, etc. Our high intellignet and creative products creat more times NO.1 in China. They can walk, lay egg, and be ridden, fight, swim, smoke, communicate, identify people, record figure and language, sell goods and greet guests, etc. More functions our research team is under developing all the time.We hold the concept of customer first, design and manufacture products according to customers' requirements and provide long time quality guarantee. It fits for all of our company's animatronic models. Design, manufacture and display of animal, dinosaur model, colorful lanterns, landscape, etc.